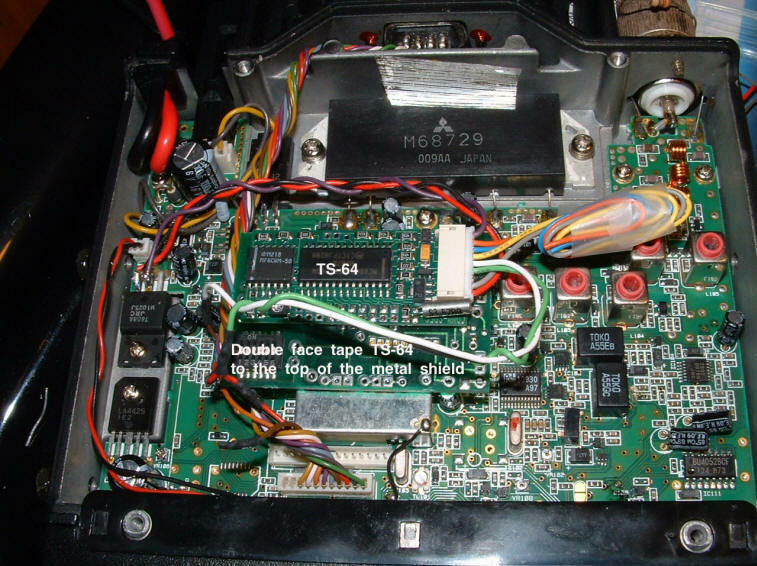 Adding a TS-64 as a CTCSS Decoder to the Alnico DR-235 radio. I needed to replace the 5610 IRLP Node radio that was a modified Midland 13509 with a newer radio. but no fixes. The following is my answer to this condition. I only use the decode function on the TS-64! the pictures I have taken of my modification. Remove all power from the radio! Set the CTCSS decode switches (or jumpers) to the desired decode tone. 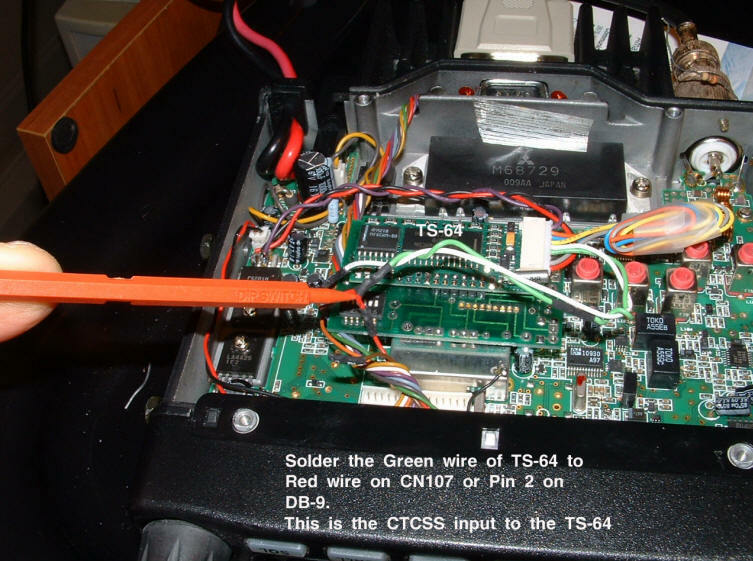 Solder a jumper across JP7 on the TS-64. be upside down with the DB-9 to the rear. You will see IC-115 to the left (7808) with the leads pointing to the rear. You will see connector CN107 (11 pins) to the front. the square silver shield in front of CN105 with the TS-64 connector to the right. soldered to the center lead of IC115 (Ground) The Red wire should be soldered to the left lead on IC115(+8 Volts). was shorted in this step. CN107 and connected the White wire from the TS-64  to the lead going to the rear DB-9. This is the new COS (150ms)! and will not be used anymore (500ms). 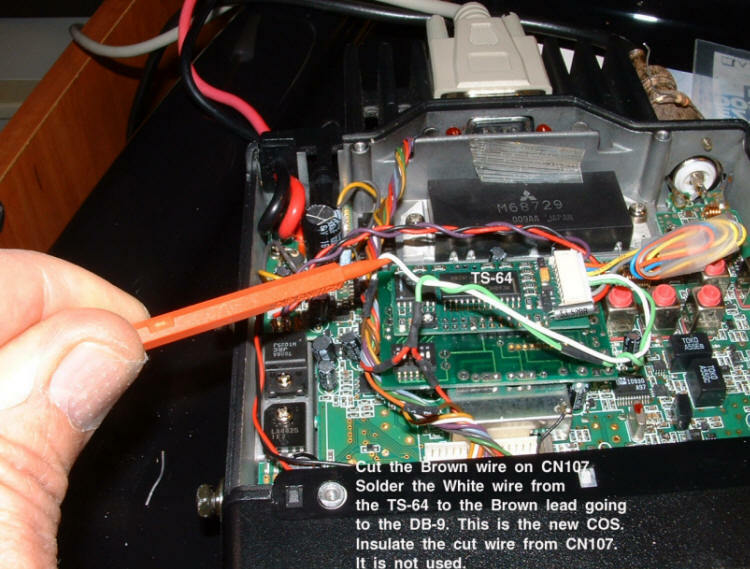 Check all your solder joints and double check you work. Shake out any loose debris. Test your radio and button it up. It seems possible all this could have been done in an external metal box with DB-9 connectors for in and out. rear mounted DB-9. 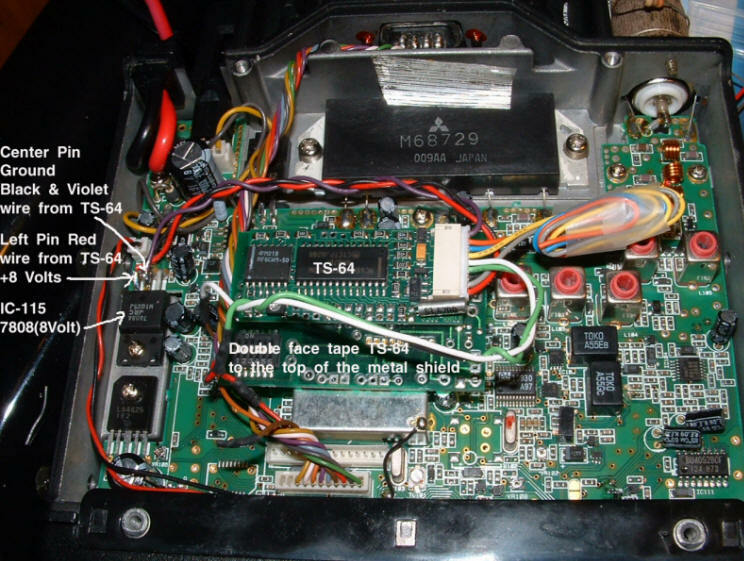 For simplicity of hardware and shielding, I chose to keep it all in the radio. kd6hwc on node 3598. The PTT line on the DB-9 is pin 7 and the color is Violet.